The Wealth Planning Blueprint is provided to clients after their personalized Strategy Session with one of our professional Advisors. 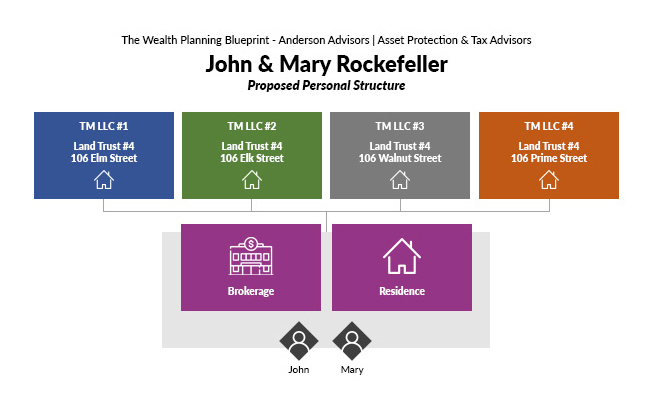 The blueprint includes a step-by-step approach to structuring your assets and estate in a way to minimize your taxes, protect your assets and create a legacy for your estate. You’ll sleep better at night after implementing your blueprint knowing you have the best possible structure setup for your unique situation. The solutions provided as part of the blueprint may include specific entities you should form. We are confident that you will have the trust in our services to structure those entities for you and provide additional services that will turn into a lifelong relationship with Anderson, you and your family.